We have added a new gallery to the site: the XJR1300 that was part of the exhibition at Dunkers. We gave out painter Bassel complete freedom to do as he wished with this one, the result is a striking bike. Head on over to the gallery in the museum section to see all the pictures! Our bike exhibition at Dunkers Kulturhus is going well, there’s always a steady stream of people stopping and looking at the bikes. You can see more information about the exhibition here. The Midnight Star 1900 was created by Apparatjik (Magne Furuholmen (A-ha), Jonas Bjerre (Mew), Guy Berryman (Coldplay), Martin Terefe (producer)), the Golden YZF-R1 was created by Kjell Nupen. 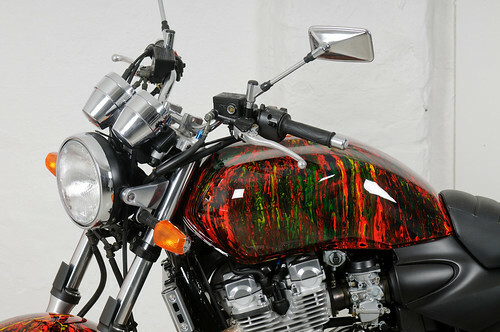 The XJR 1300 was created by our resident painter Bassel Afara. The AS1 was created by Lone Recht. The AS3 Titan, you know from before, the gallery is here. The AS3 art has been made using pictures by Per Johnsson. Big thanks to Yamaha Center for all the help with the projects. When we first introduced the AS3 ‘Art’ project we were quite vague on the details about what the project was about. Tonight I can tell you more. Ole’s company is celebrating 40 years in the art world and so put together a big exhibition at Dunkers Kulturhus here in Helsingborg called Under Stor Press. Translated directly it means Under Great Pressure. Taken in the context of intaglio printing, Stor Press is wordplay refering to the big printing presses used to create the works. The next step of the exhibition is motorcycles transformed into art! 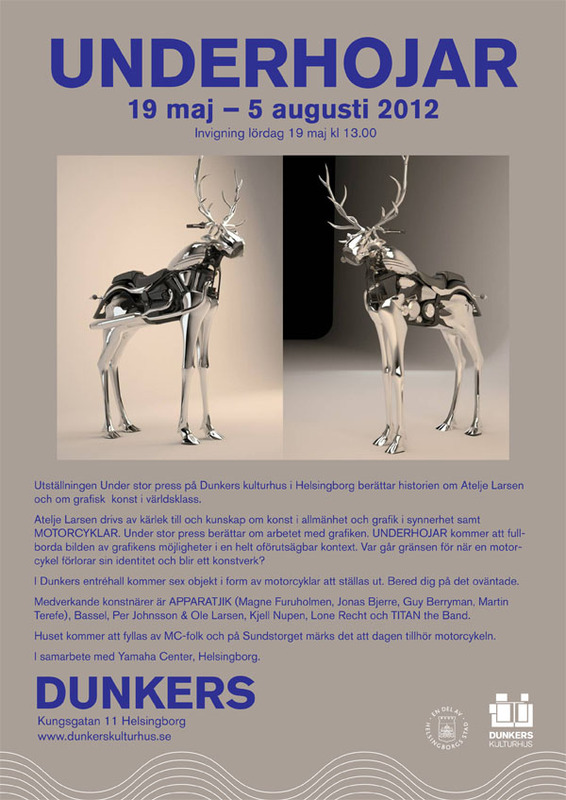 The name of the exhibition is Underhojar which translates to Wonderbikes. We’ve used the same intaglio techniques to transfer prints to the AS3 ‘Art’ project. Alongside the AS3 we’ll also be displaying a handful of other motorcycles transformed into art by a number of Artists. One of the motorcycles is done by Apparatjik (Magne Furuholmen, Jonas Bjerre, Guy Berryman, Martin Terefe), shown as concept below, another is done by Kjell Nupen. Bassel, our painter, is creating a custom bike. Lone Recht is using the AS1 we showed in the last update. You can see the swedish information below. Click through to the AS3 ‘Art’ project to see a quick teaser of the finished result. Both exhibitions will run until the fifth of August, if you’re in Helsingborg or the Öresund region, stop by and take a look. This is hopefully the last post that will be made with the old website, I have almost worked out all the kinks to get the new site up and running. I’ve added a lot of new things but I’ll let the specifics be a surprise! The frame is back from Bassel with a fresh coat of paint. Now it’s time to get building!